Last night was the Season 2 finale of Dana White’s Tuesday Night Contender Series. Following the event, White fielded questions from reporters. Two topics that came up were the two biggest stories coming into the series: Greg Hardy and Nick Newell. Hardy found success on the show not once but twice. First, Hardy scored a knockout victory over Austen Lane in the season premiere’s main event. He then closed the season out with a 17-second blitz of Tebaris Gordon that sacked his opponent’s hopes of earning a contract into the UFC. Greg Hardy’s developmental deal with the promotion stands strong, and the criticisms of him on social media remain even firmer. When asked if he had been confronted with such criticisms about Hardy, White once again spoke up for Hardy and the belief in second chances. While one door closes, one door opens. 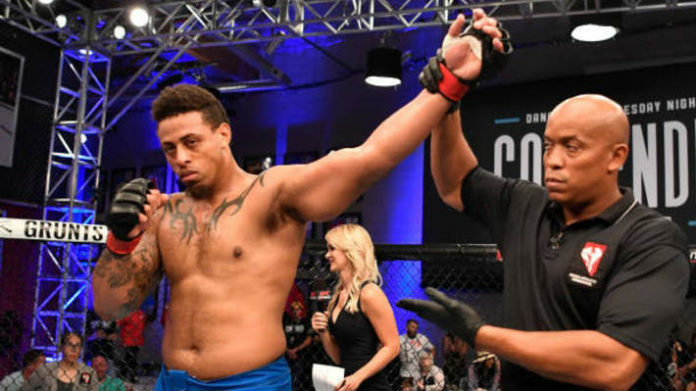 It seems the door for Nick Newell’s UFC dreams is firmly shut, while Greg Hardy’s has only begun to crack, even though Hardy insists on kicking it down when met with resistance from opponents and critics. Did Greg Hardy rightfully earn a UFC contract?